Laurel Nicholson has a secret. When she was 16 years old, she witnessed a shocking crime, but she never told a soul about it. Now, 50 years later, she is drawn to uncover the truth behind the crime before her mother, Dorothy, the one person who knows the truth, dies. Dorothy is remembering her past as a young woman in London during the Blitz, before she met Laurel's father and became a loving wife and mother. Her past is what Laurel needs to uncover if she is to understand the motive behind the crime. The Secret Keeper by Kate Morton is an epic drama full of mystery and family secrets. Laurel's story was a bit more relatable as she is in more modern times, dealing with an aging, dying mother and her family all around her. Dorothy, on the other hand, lives in 1940s London and longs to be more than she was born into. She latches onto a woman who epitomizes what she wants her life to be, while struggling to hold onto the hometown boy who is content with what he already has. I loved the way the story was built up and the truth was drawn out. The relationships that Morton creates are so real and the characters true. It was hard to reconcile the mother that Laurel knew and the woman she had been in London, who was a bit more difficult to like. But everyone changes to some extent as they age, especially when tragedy strikes. And it all made sense in the end. I loved Morton's The Forgotten Garden, but I found The Secret Keeper to be a bit less complicated than that since it's only two different time periods to keep track of. The story was intriguing and mysterious but easy to follow. And the characters were easy to care for. 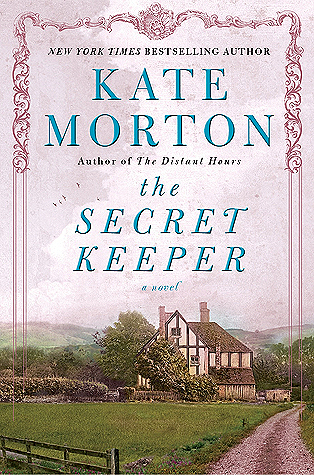 If you're looking for an engrossing story that will pull you in and offer up plenty of surprises, I highly recommend The Secret Keeper. This review was written based on a copy of The Secret Keeper that I purchased. This post includes Amazon Affiliate links. If you purchase something using my link, I will receive a very small commission but your price does not change. I hope I can get to this one for Big Book Summer Challenge! Sounds great! I haven't read this one yet, but I also enjoyed The Forgotten Garden.